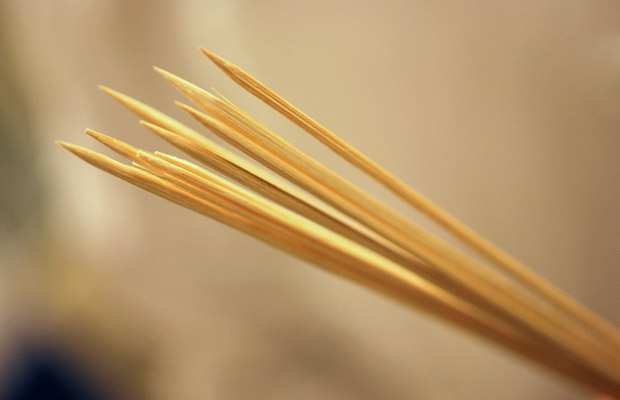 I recently came across an article in the Edmonton Journal about Bamboo Skewers and how to stop them burning to a crisp on the BBQ. Being an Aussie BBQ’s are very much part of our lives so I thought I’d share the story with you so we can all have great looking kebabs. Bamboo skewers are great for grilling, though sometimes they’re a bit of a pain, what with bamboo being combustible and all. If you’ve ever thrown some kebabs or satay on the grill, there’s a good chance you’ve lost part of a bamboo skewer to the flames. What’s a barbecue chef to do? First and foremost, soak your skewers in water before using them. While 30 minutes is the minimum, it’s best to plan ahead and soak your bamboo skewers overnight in water. It takes a long time for the skewers to soak up the water, but well-soaked skewers, which are slow to give up their moisture, will last longer on the grill without burning up. Put them in a cake pan, shallow plastic storage container or baking sheet with water in it, then put a plate or other heavy object on top of the skewers to hold them underwater. To prevent mid-skewer breaks, make sure the meat or veggies cover the length of the skewer without interruption. The food protects the skewers from the flames, while unprotected areas are more likely to scorch, weaken and break. When rotating or flipping the skewers, don’t hold onto the ends, which will become more fragile the longer they spend on the barbecue. Instead, use heat-safe tongs to grip and flip the skewer by the meaty section. You can also leave long edges of the skewers hanging over the edge of the barbecue, which will keep them from burning over the direct heat. If you have a multi-burner grill, you can also position the exposed ends of the skewer above a burner that’s either off or on a lower heat setting.